Happy February! We have finally had a little sunshine here the last few days and it actually feels like spring is on its way. I love how a little sunshine after these long grey days can brighten everyone's mood. These pics are all from January from my Instagram. Looking back at these there have been quite a few beach walks, despite all the rain and snow we've had. There are only so many home days I can do before we need to get out and about and the beach is usually our first choice of places to go! A little sea air always clears my head! We have coughs and colds again here and are all feeling pretty tired and run down. I'm quite glad we are in February now, its a step closer to some warmer weather and hopefully a few less bugs too! Such a gorgeous mosaic of fun and colour - it's raining with us today. Hope you feel better soon - I know how it's been recently with all the unwellness. I hope you all recover from your coughs and colds in time to enjoy the weekend. I like February - it's a short month and once March arrives I feel like spring is in sight! 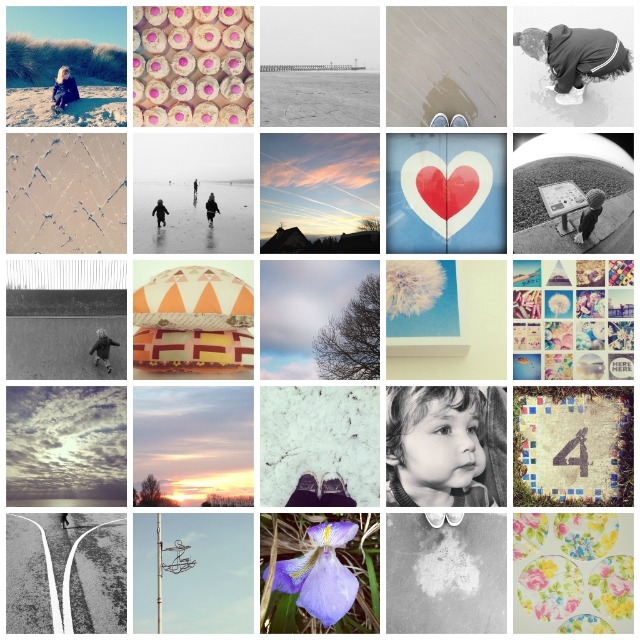 Lovely photos, they are like a little mosaic of your life. Great photos. Hope you're all better soon. I feel like Spring is on its way having seen a several large clumps of snowdrops today. A lovely mosaic of the last month.... is that an anchor street light on the bottom row? I've never seen them before but what a great idea to have by the seaside! Hope you're all feeling better soon; if I could post you some sunshine I'd gladly do it. Such pretty colours, they look so lovely together like that.